I won’t gloss it over. The first night was a bit grim. Our early evening departure all went smoothly enough, with the newly returned and ever increasingly ocean-hardened Henry Mccann nicely taking Discoverer off the dock and out of the harbour, affording me a throwback to the world of coiling mooring lines and slinging fenders around. 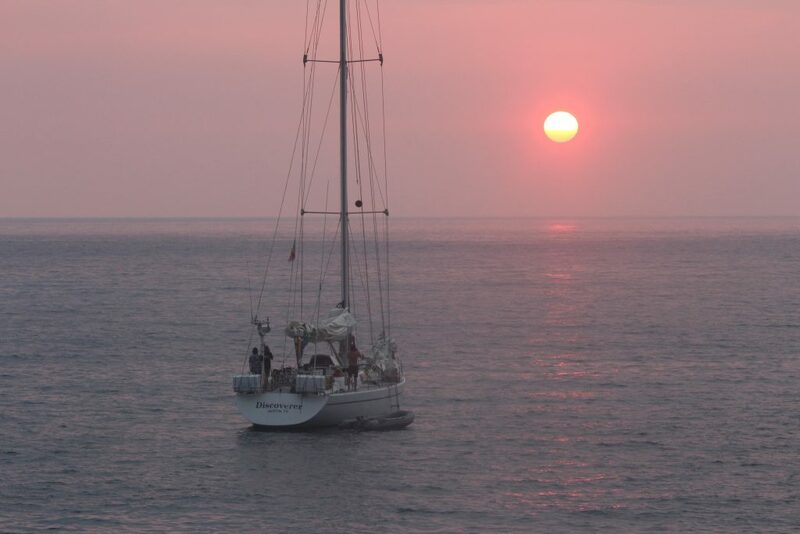 With the sun setting across the western O’ahu providing us a colourful and dramatic backdrop to our last Hawaii moments, we hoisted the mainsail, threw the staysail up for good measure, and began heading into a rising wind and sea state. 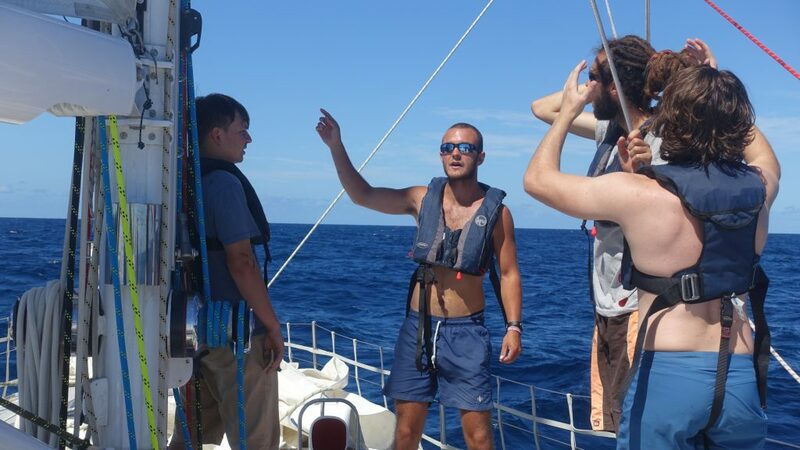 The Kaiwi Channel, which we had to sail north out of in order to clear the islands, funnels the typical NE/ENE pattern of trade winds through it, creating a fairly uncomfortable experience. Last night was no exception, and we had the pleasure of our first night in these conditions, which is never an ideal start and acclimatisation to life back on the boat, rapidly leading to most of the team dropping straight into seasick mode. Then the main halyard failed. The outer sheath decided to part at the mast winch, leaving the slick internal braid unable to properly grip on the winch, the tough external cover retreated into the mast with the probable intention of getting caught on everything possible. A bit of a pain that, but nothing resembling unmanageable. 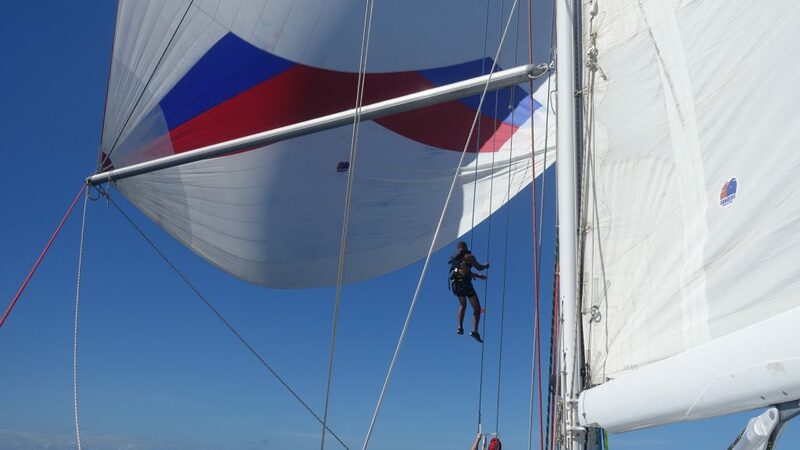 All we do is take the mainsail down, mouse the halyard out with a light line, and then run a replacement bit through. That is, unless the halyard then completely parts, leaving nothing with which you can pull a new line through. It did, of course, do exactly this, halfway through running it the mousing line in. 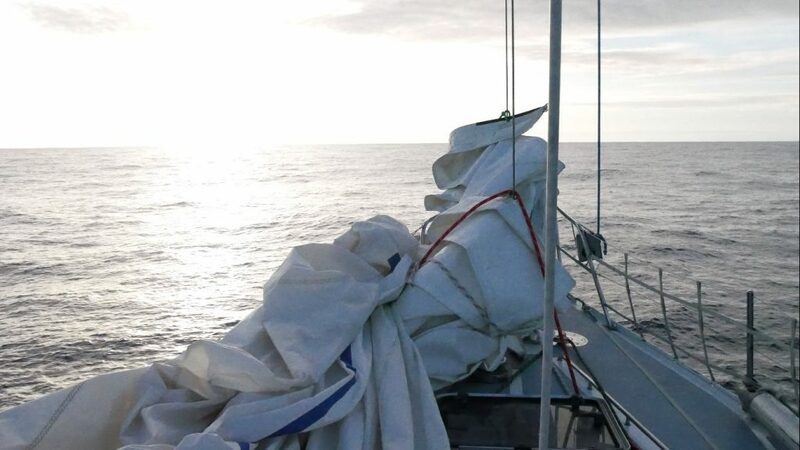 So, now we’re in the middle of the Kaiwi Channel, hove to under staysail only, pitch black, mainsail all over the deck, bits of line everywhere, drifting straight back over the hard won height of the tack before it all went wrong. Not at all ideal, and always in the dark! I’d take another 10kts of wind and daylight anytime for dealing with rigging breakages. Maybe even 20kts. Not comfortable with putting someone up the rig in the combination of conditions and darkness, we cleared the mess of line, and repurposed the topping lift as a main halyard for the night, as the only other line that runs out of the back of the masthead. This makes any mainsail evolutions pretty hard, as it’s on a much less efficient winch, has much more friction in its lead at the blocks and clutches that adorn the mast base, and doesn’t allow us to properly depower the mainsail when changing sail plan. Still, better than drifting into a Hawaiian island, and the team did a great job of dragging the main back up. The rest of the evening was spent slightly underpowered, but steadily making ground out of the channel and into the waiting ocean. This left the best possible situation for everyone to try and settle in, do the seasick thing, and get as much rest as possible, without creating potential for new drama. Even I was feeling decidedly rough, which very rarely happens, the result of an extended stint trying to sort through spare running rigging with tiny labels in a rolling sail locker during our halyard fun. The first night out probably won’t make an ocean passage, but it sure will break it if everyone gets off to a really bad start. So a reduced sail plan and consistent progress was the go, rather than emotionally break everyone in the first 12 hours. Daylight, as always, improved the situation. We were able to put mast koala Mccann up the rig (he’s loving being back) armed with a heavy shackle pin as a plumb and length of light line, ready to try and thread the way for a new main halyard. 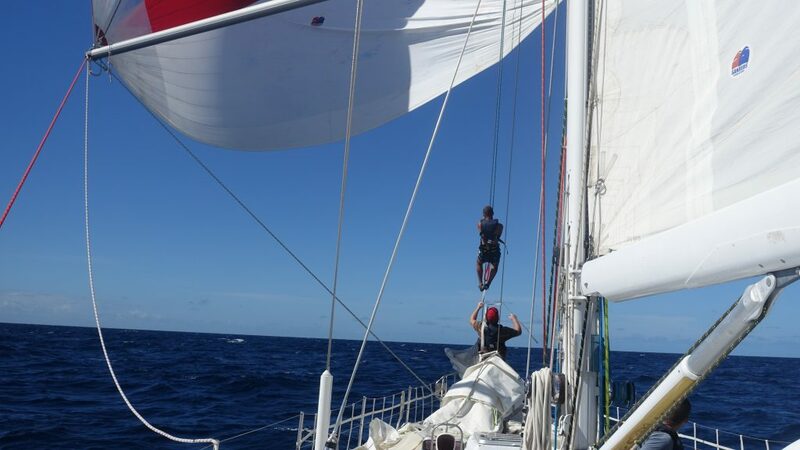 We tacked over and hove to immediately, so to steady the boat as best we could, and ensure we were heeling in fashion that would reduce the risk of the line tangling around the other 7 halyards already inside the mast. This is a game that has the potential to take hours, and be incredibly frustrating. However, we got our lucky break and cracked it on the first try, the replacement halyard soon whipped on, and with some more aerial knot tying action, the main was once again held up by the proper means, the boom complete with a topping lift reattached, and a slightly bumped koala returned to the deck. He’s obviously got a bit soft sailing little racing boats across the Atlantic recently. Don’t worry though; we’ll toughen him back up over the next few weeks with some proper big boat sailing again and try to get him back in shape. Finally happy the boat was properly under control again, we chucked the yankee 2 up for a long overdue headsail, and are now making decent progress NNE, just a bit off the ideal angle I want to make for our first weather routing waypoint. We are all sad to leave Hawaii behind, as it’s been an amazing place. I had the pleasure of having my mother come out to spend some time with us, and provide a dose of surrogate mothering for the whole team. We took her sailing with a good night or two of hard on the wind in something getting towards near gale force for a proper Disco sailing experience, and she created the best cake and bakery results the boat as ever seen, and kept us eating fresh food along the way. We’d have taken her with us on this one if we could, but it might upset my Dad if she managed to outdo his Atlantic sail on Disco by doing the Pacific, and I don’t want to get in the middle of that one! Big thanks to the Hawaii Yacht Club for hosting us during our time in Honolulu. They provided a fantastic welcome with great hospitality, and looked after us well, including helpful advice and a well stocked bar throughout. If you ever sail into O’ahu, it’s the place you want to be. 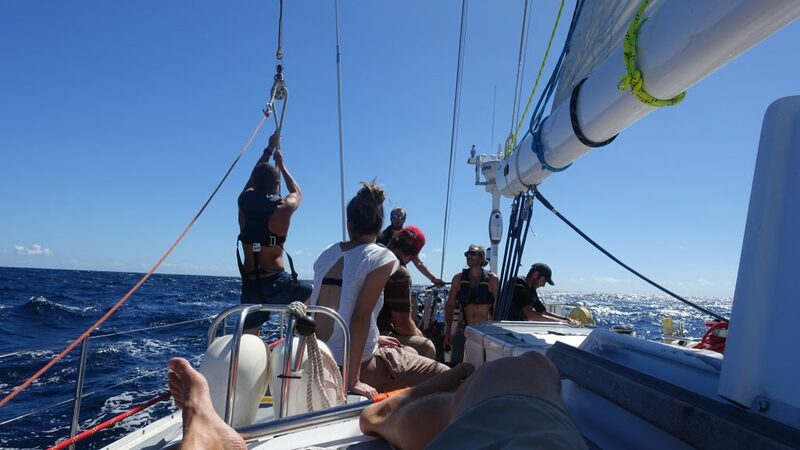 I certainly plan on being back for some more Hawaii sailing. I’m off to the deck for a bit. It’s a hot and uncomfortable boat right now, hard on the wind and a truly tropical clime, but I’m seeing sixes and sevens on the VMG, which means it’s worth it. Bring on some cooler conditions, or an air conditioning budget. Either is fine by us.